One of the affordable Android smartphones launched last year in the US, the Moto E4 is now available from T-Mobile. Of course, the cheap handset is already up for sale at MetroPCS where customers can get it for just $60 after various discounts. However, T-Mobile sells the Moto E4 for $175 outright or $7 down and $7 per month for 24 months. The smartphone comes with support for 4G LTE bands 1/2/4/5/7/8/12, but it's also fully compatible with the carrier's HD Voice and VoLTE. As far as specs go, the Moto E4 is far from being impressive, but it definitely does its job for the price you pay. The insides of the phone include a low-end quad-core Qualcomm Snapdragon 417 processor, 2GB RAM, and 16GB expandable storage. Also, there's an 8-megapixel camera on the back, as well as a secondary 5-megapixel selfie camera in the front. Even though it's an entry-level device, the Moto E4 features a water-repellent coating and sports a 5-inch display with HD (720p) resolution. Unfortunately, it does not come with Google's newest Android OS version, but at least it includes Android 7.1.1 Nougat out of the box. You can check it out at the source link below. If you save another 50 you could get the Moto G5 or get a Huawei or Honor to. $25 short of the FAR superior Honor 7x. Moto E4 for $175? Don't make me raf, hahahaha! I bought the Verizon Moto E4 at Walmart for $40 and bought the unlock code (for use on GSM network) on eBay for $2. 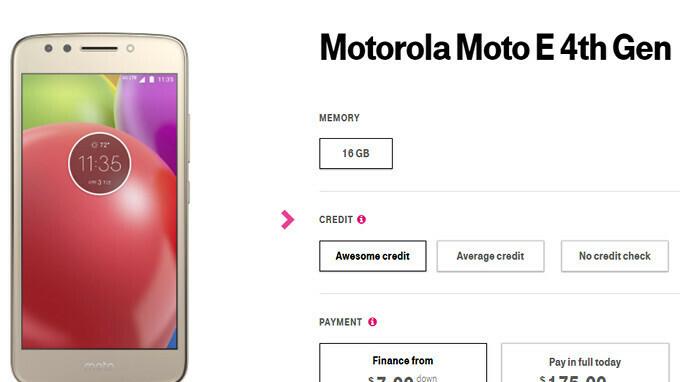 What a rip off, Tmobile!